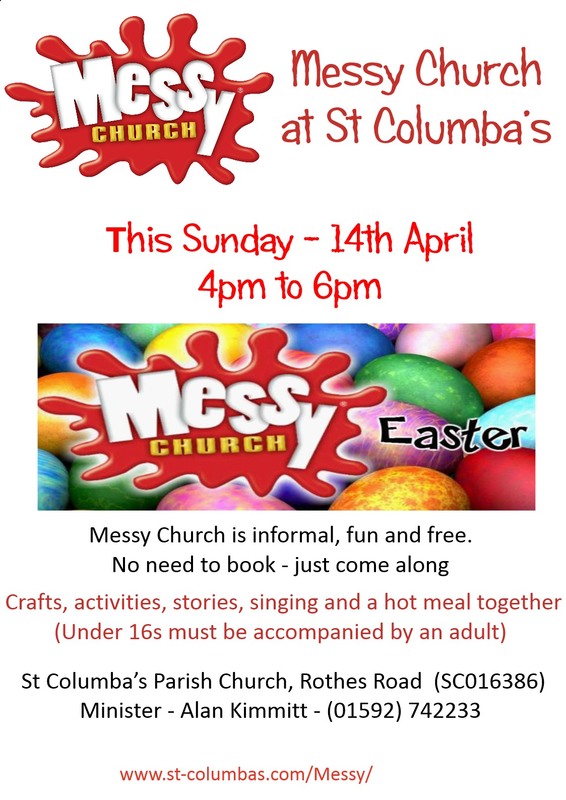 NEXT MESSY CHURCH – SUNDAY 14TH APRIL – 4PM-6PM. Messy Church meets on the second Sunday of each month except July & August. It is a very relaxed style of church for families and others. Come in through the main church doors at around 4pm (don’t worry if you are later than that). You will be greeted, we take a few details and you get a name badge. After that, someone will take you to the craft and activities room. Alternatively, there is a quieter room, sometimes helpful for very young children or babies, or there are games in the large hall. After about 45-50 minutes we go through into the church for some shared worship. This is very informal, with stories, songs, drama and activities. At around 5:10pm, we go through to the large hall, where we share a meal together, celebrate birthdays and at around 5:45pm, we have our final song. After that, people are welcome to linger and chat until 6pm if they wish. Messy Church is free, but there is an opportunity to make an offering towards costs, if you wish. It is specifically designed to be interactive, fun and relaxed and suitable for those of us with a slightly messy lifestyle! For more details of Messy Church see the Messy Church web site. 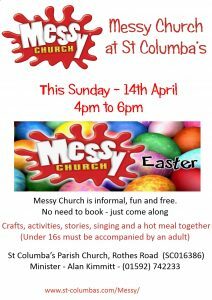 If you have any questions about Messy Church at St Columba’s, please contact us.